Home > Horsemanitarianism 101 • Mare's Musings • Mark Your Calendar!!! > Thanksgiving 2013: The Race Track Chaplaincy of America/New York Division…and You…Me…Us. Horsemanitarianism 101Mare's MusingsMark Your Calendar!!! Thanksgiving 2013: The Race Track Chaplaincy of America/New York Division…and You…Me…Us. Here in the United States, this coming Thursday (November 28th) is a holiday we call, Thanksgiving. The Race Track Chaplaincy of America / New York Division once again will do two really wonderful Thanksgiving-ish things for the people whom they serve with great love, 365 days a year. I’ve just taken the NYRA (New York Racing Association) press release that I received a few minutes ago–jijjed it up a bit–and highlighted contact info for both donors and media. No fancy pictures–not even NYRA or RTCANY logos in this one: my computer had a cerebral hemorrhage this week, and I’m using a loaner until or unless my laptop can be fixed. So this is a bare-bones article–I hope that you don’t need pretty pictures or logos–I hope that words are enough to convince you to care. And if you care…perhaps you’ll decide to help. Thanks for reading, folks–have a wonderful, blessed Thanksgiving, wherever you are. And if you’re not in America on Thursday, November 28th–heck, celebrate with us, anyway! Have a turkey, tofurkey or sprouts sandwich, and thank God for all you’ve got. OZONE PARK N.Y. – The Race Track Chaplaincy of America, New York Division (RTCANY) will again give away hundreds of turkeys this week at Aqueduct Racetrack, Belmont Park and Saratoga Race Course to needy families within the New York thoroughbred industry. 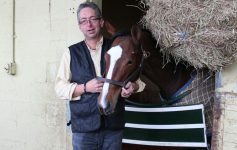 As part of the initiative, now in its 13th year, the RTCANY identifies families in need or those struggling financially at the three New York Racing Association (NYRA) tracks and also at various area breeding farms. In addition, turkey dinners will be served to backstretch workers at Aqueduct Racetrack and Belmont Park this Tuesday, November 26. “The food donation that we provide is so important during the holidays for the workers who take care of the industry’s horses all year long,” stated Humberto Chavez, RTCANY Chaplain. The program is funded largely through donations. This year’s sponsors include The New York Racing Association, Inc., The Jockey Club Safety Net Foundation, The New York Thoroughbred Horsemen’s Association, and Island Harvest, along with many individual donors. If you would like to donate, please call (516) 835-0275 or visit www.rtcany.org. Donations will be distributed to recipients at Aqueduct on Monday, November 25, between 10:00 a.m. and noon at Backstretch Gate 6. At Belmont Park, donations will be distributed on Tuesday, November 26, between 10:00 a.m. and 1:00 p.m. at Belmont’s Backstretch Gate 6. Turkeys at Saratoga Race Course will be delivered directly to families. Chaplain Humberto Chavez; Karen Chavez; Nick Caras and the team will be very happy to accept your donation. And they’re all wonderful souls, who work without rest for the good of the good people who work with race horses, every day of the year. The primary focus of the Chaplaincy is to address the spiritual needs of the personnel at NYRA tracks. The Chaplain serves as the official minister to all of this unique population without regard to race, creed, religion, background or social status. The following services are provided, with the intent of satisfying not only the spiritual needs but also the human necessities. It is the understanding of the Race Track Chaplaincy NY Division that one cannot minister to the spiritual needs of any individual without ministering to the whole person. For that reason, programs have been implemented for the past 20 years to address the various needs of the backside village personnel. 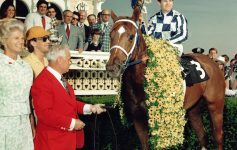 About The New York Racing Association, Inc.
NYRA’s mission is “Meeting the highest standards in thoroughbred racing and equine safety.” Founded in 1955, and franchised to run thoroughbred racing at New York’s three major tracks (Aqueduct Racetrack, Belmont Park, and Saratoga Race Course) through 2033, NYRA boasts a lineage that actually stretches back almost 150 years. NYRA tracks are the cornerstone of the state’s thoroughbred business which contributes more than $2 billion annually to New York State’s urban, suburban and rural economy. Previous Article “Track Life: Images and Words,” by Juliet Harrison. Launch Party November 16th! 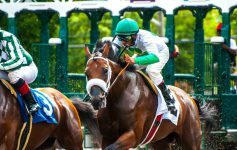 Next Article Why Horse Racing in Georgia? Because Mucho Macho Man Makes Us Cry.